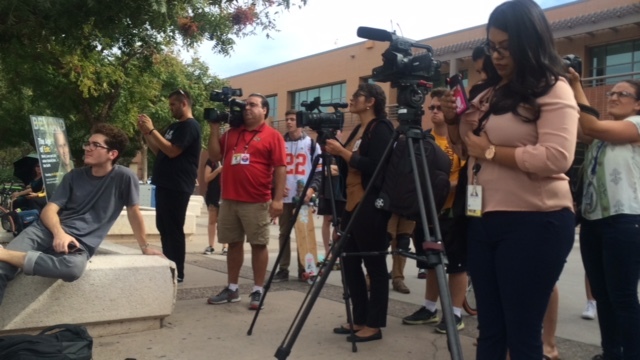 As Donald Trump Jr took to the Sun Devil Fitness Center on Tuesday, accompanied by Sheriff Joe Arpaio, most were not as enthusiastic as the Trump campaign might have hoped. Although a large crowd awaited Junior’s chanting and tales of the American Dream inside, the crowd outside told a different story. ProgressNow Exec Josselyn Berry led the protest by talking of Trump’s privilege and how this is in insult to the young, hardworking people at ASU. Student Belen Sisa then spoke of her position as an undocumented student at ASU, and how Donald Trump’s presidency has the potential to directly impact her life and her loved ones through the threat of deportation. ‘Trump Jr coming to speak to millennials today is a slap in the face to the students sitting feet away in classrooms. 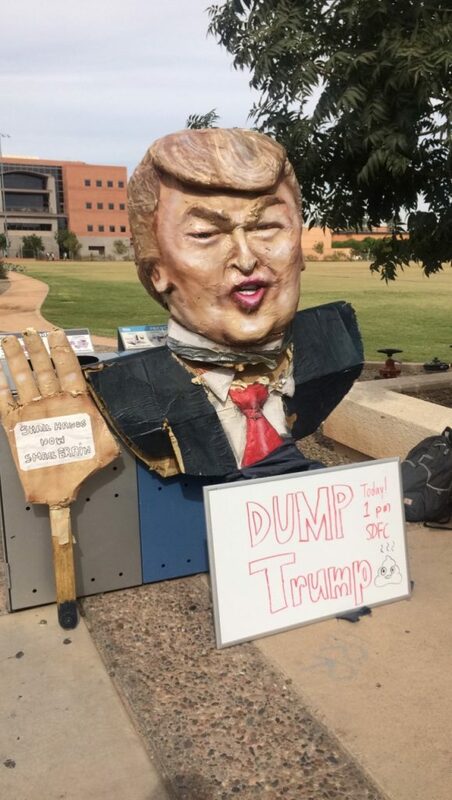 Students with disabilities, students who are women, Muslim students, foreign students, undocumented students… and the list continues of his personal attacks on students at ASU. “ASU students do not sympathize with racism, we do not sympathize with buildings of walls, with sexual assault, bigotry or hate. Inside, Sheriff Arpaio cracked jokes despite his impending criminal case and Trump Jr cracked down on criticism of his father. The chanting of the protesters outside begged to differ.